This kitchen counter coffee bar and beverage station project is one for both my fellow coffee lovers & organizing enthusiasts! It’s my favorite DIY budget friendly makeover project so far. If you’ve been thinking about creating a coffee and beverage space in your kitchen, this may give you some ideas to get started. 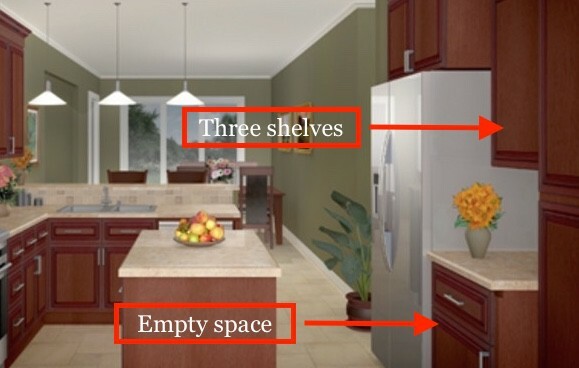 Our original house plans had a small area between the fridge and pantry for two cabinets and a small kitchen counter space (see below). Instead, we decided to leave the bottom area empty and build three open shelves above the small counter. I thought the empty space would be a great place to keep a trash can out of the way. I was showing the plans to a coworker who said I should consider a beverage cooler. She said it was great for kids to grab a juice box and to save space in the fridge. That idea was out until I came across one in an overstock/refurbished building supply store. It had been used somewhere as a display model and we paid $100 for it. Score! She was right. It is great for kid height and saving space in the regular fridge. Side note about the mini fridge- We also found out [when Hurricane Irma knocked out our power for a week] that it runs easily off a generator and is great for a back-up! The counter area and shelving above the beverage cooler became a space for mostly cook books and OXO containers/snacks. 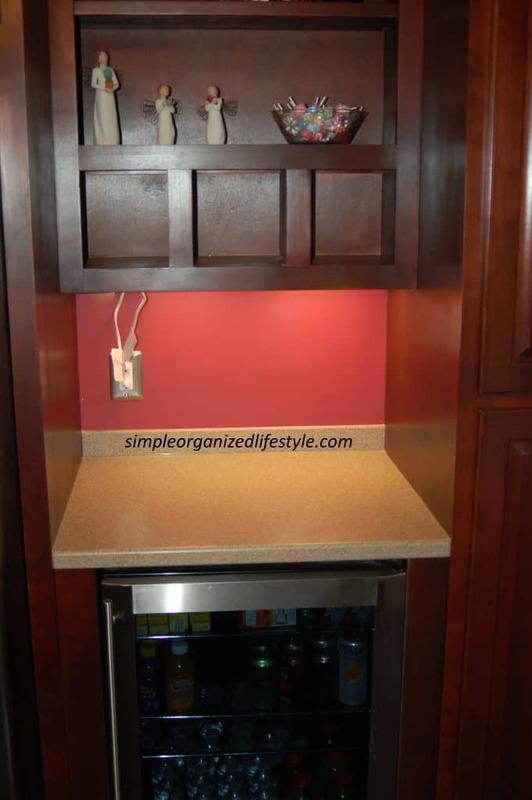 However, I recently realized that this area was perfect for a built in coffee and beverage station. Funny how you get used to a space and it’s hard to picture it being anything else. 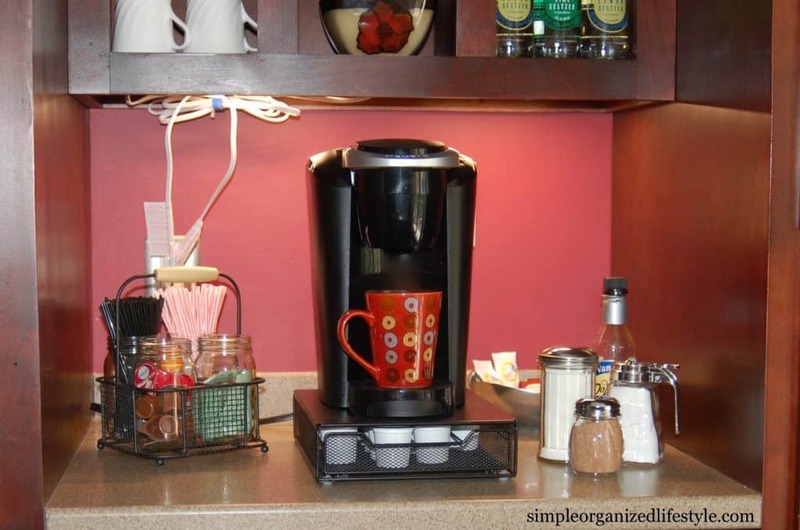 I went to Pinterest and found a little too much inspiration for how to make a coffee bar lol! Here’s how the DIY coffee bar plans turned out as well as some ideas for coffee stations in kitchens with a small counter space to work with. The small counter space above the beverage cooler and part of the open shelving after I moved all of the OXO containers and cookbooks from the box shelves. The fun part! Since I already had the coffee maker, my main goal was to get a piece to hold small creamers (for guests), sugar, etc. I ended up with a mason jar silverware caddy to use for that purpose. I love the coffee sign from Amazon below, but it would have blown the whole project budget. Still, I’m going to keep an eye out for one at discount stores. I love how everything turned out with the new accessories and what I already had. It is such a treat to use this space every morning! I already had a small, slim Keurig. I’m the only coffee drinker so it works out great for an individual cup of coffee. I also already had a narrow metal drawer that holds 30 K-cups. It looks like this drawer has since been redesigned with a solid front and knob pull. I moved over some mugs out of the cabinet and used two bottles of wine for cookbook bookends. 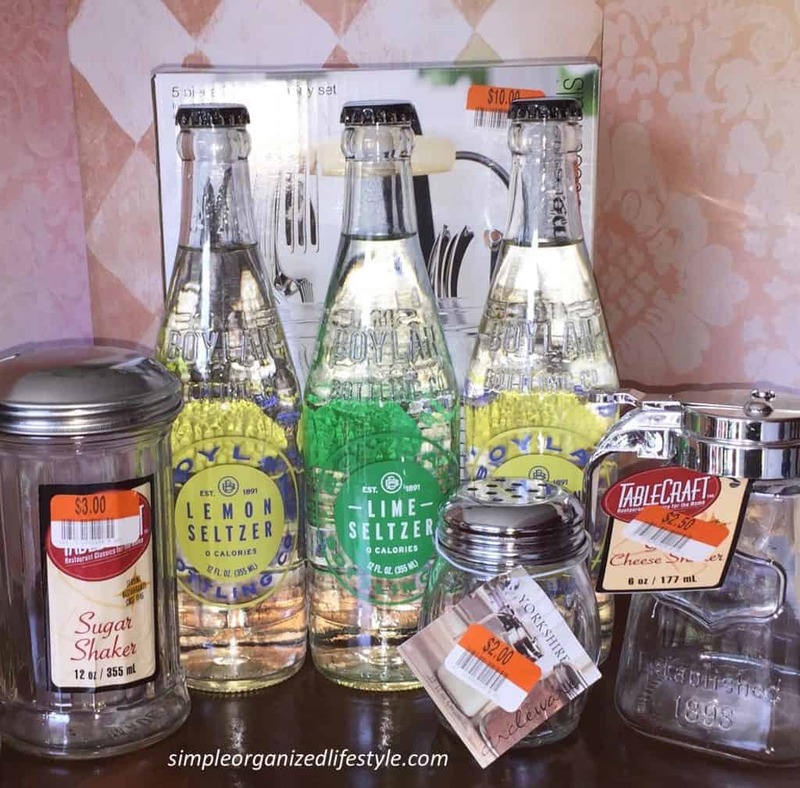 The mason jars hold some individual creamers, stir sticks, straws and packs of raw sugar. The accessories hold sugar, cinnamon and milk I can pull out quickly from the mini fridge. 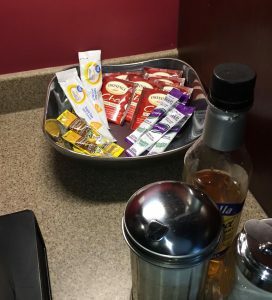 In the back corner, I have a silver tray with chai teas and drink mixes. As soon as the weather starts to get cooler, I can definitely see this changing to hot chocolate and mint tea. 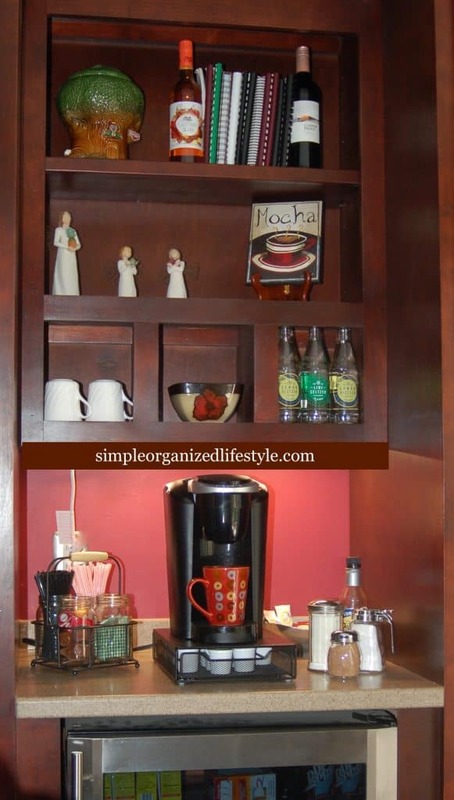 Hopefully this will give you some ideas if you are thinking about using a small counter space for a DIY coffee bar and beverage station. Amazing how a kitchen counter coffee bar project can transform a space and make the morning routine more enjoyable! I enjoy my morning cup of coffee and an organized space, so this is my favorite budget makeover so far. Ha, yes! When we’re past the juice box phase, that will be next! Your kitchen is so pretty. And I love the coffee bar station. That’s a great idea.